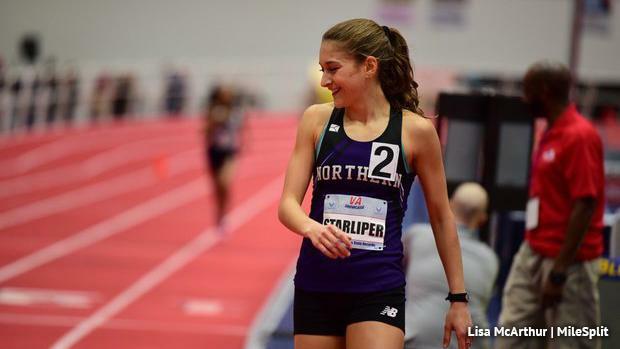 Fresh off the third fastest indoor 1K in PA state history at the VA Showcase, Marlee Starliper will be headed to another big meet this weekend. Only this time, she won't be competing against high schoolers. The Northern junior is entered in the invitational section of the 3,000 meters at Saturday's Penn State National Open on the Ashenfelter Track in University Park. The race is scheduled to go off at 4:40 P.M. tentatively. Entries were released Tuesday and Starliper will find herself in a field that includes some familiar names to those who have followed Pennsylvania high school running. 2017 PIAA Class AAA XC champion Elizabeth Mancini (LaSalle University) and her sister and teammate Grace Mancini (second at the NCAA DI Mid-Atlantic Regional in the fall) are entered, and two-time PIAA Class AA 1,600 meter state champ Jordan Williams (Penn State University). Starliper has never run a fresh, all out 3K in her career, so Saturday's race at Penn State will be a first for her. Starliper ran a PA#2/US#10 9:55.39 at the Susquehanna River Hawk Invitational two weeks ago, not long after running a 2:15 800 meters in the same meet. This past weekend at the VA Showcase, Starliper kicked to the 1K win, running a US#3 time of 2:50.25 (also PA#3 all-time). Watch that race above. The Penn State National Open will be live Friday and Saturday on FloTrack! Subscribers to FloTrack can stream the action HERE.